The reign of Vikings is coming to an end. Deadline reports the History TV show will end after its upcoming sixth season. The historical drama delves into the Viking warriors and their strange, ruthless world. The cast includes Alexander Ludwig, Alex Høgh Andersen, Peter Franzén, Katheryn Winnick, Jordan Patrick Smith, Gustaf Skarsgård, and Jonathan Rhys Meyers. According to Deadline, Vikings will debut its sixth and final season sometime later this year, with the final episodes airing in 2020. 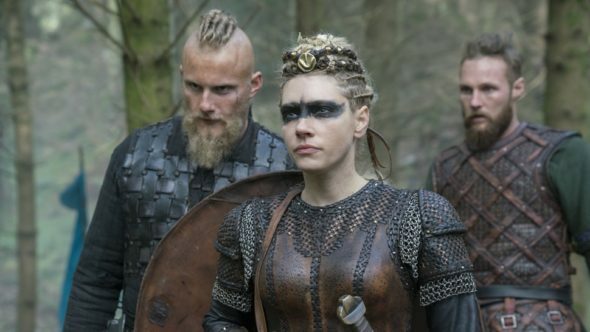 And while the History series is coming to an end, Vikings creator Michael Hirst and MGM Television are reportedly looking to franchise the show with a possible spin-off. What do you think? Do you watch Vikings? Would you watch a spin-off? Have watched Vikings from the beginning and enjoyed the entire ride. I do think it has a natural lifespan and that line has been reached. Hope another type of production in this vein will make an appearance. Great casting, great scripts, great production, great music, great scenery…Simply awesome! Thank you. My wife and I really liked watching Vikings. We both agree it’s time for it to end. The scripts have become thin and predictable. I have watched Vikings since the beginning. When Ragnor left the show, I worried that the plots would fall apart, not in the least. The writers have done an excellent job with Ragnor’s sons carring the show. I miss Ragnor, but have never once been disappointed or bored with the storyline. I’m extremely disappointed that the series is ending. I would definitely watch a spinoff, but please don’t end Vikings. I love that show.